Just two weeks after landing its Curiosity rover on Mars, the US space agency has announced it will send another robot to the planet in 2016. This so-called Discovery class of endeavour is cost-capped at $425m (£270m; 345m euros), although that figure does not include the rocket to launch the spacecraft. 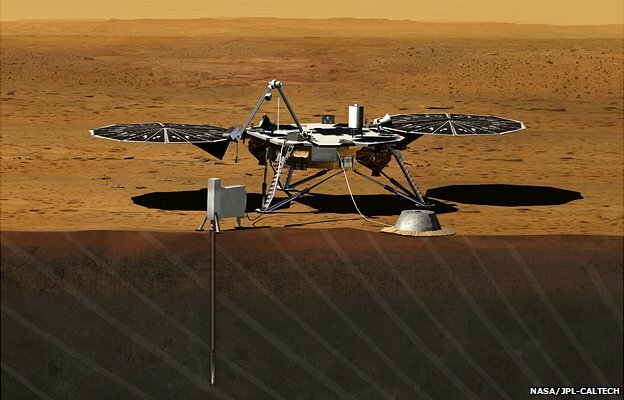 InSight stands for Interior Exploration using Seismic Investigations, Geodesy and Heat Transport.It will be led from the Jet Propulsion Laboratory (JPL) in Pasadena, California. A seismic experiment will listen for “marsquakes” and use this information to map the boundaries between the rock layers inside Earth’s neighbour. Tom Pike from Imperial College London, UK, will be working on the mission. He told BBC News: “This is not going to be a mission of pretty pictures like Curiosity, but when we get the first marsquakes I think that is going to be a really cool data set. “We’ll be doing comparative planetology. We know the internal structure of the Earth, but we have nothing to compare it with. “We don’t know if Earth is a special case or a more general case. A lot of science is based on it being a more general case because that allows you to develop theories about how the core formed, the mantle around it and then the crust on top. But we’d really like to test this out on another planet. Nasa is currently basking in the success of its Curiosity rover, which landed on the planet two weeks ago. That mission, by comparison, is costing $2.5bn (£1.6bn; 2bn euros). Titan Mare Explorer – Billed as the first direct exploration of an ocean environment beyond Earth. This would put a “boat” on a large methane-ethane sea on Saturn’s moon Titan. Comet Hopper – This would study cometary evolution by landing on a comet multiple times and observing its changes as it interacted with the Sun.